There are some days one never forgets. 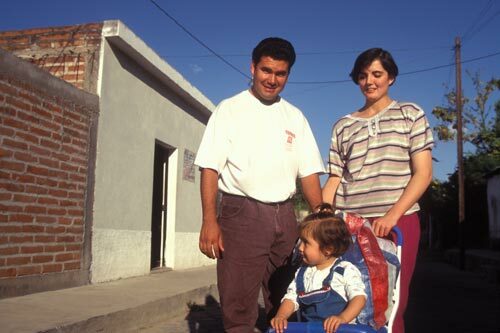 Easter Sunday 1995, on the Figueroa family ranch was one of those days for me. Unfortunately my workbook for this period of time is not to be found, so the names of Antonio’s parents, wife, daughter, brothers, sisters, nieces and nephews are not at hand. It will be hard to tell a story about a large family without their names but I will do the best I can. This story will be told in two parts. Antonio invited Anders to join his wife and daughter for a weekend trip. Antonio Figureoa had been inviting me for several weeks to spend part of Easter weekend at his family’s ranch east of town. I appreciated Antonio’s friendship and was honored by his hospitality but I would not confirm that I would make the trip. I explained to him that I was dealing with a couple of health issues that would such a trip problematic. Antonio persisted. On the Wednesday before Easter he asked me again. He talked of his family, ranch, countryside, history, views and the… I answered yes. Antonio flashed his big Figueroa smile and thanked me. 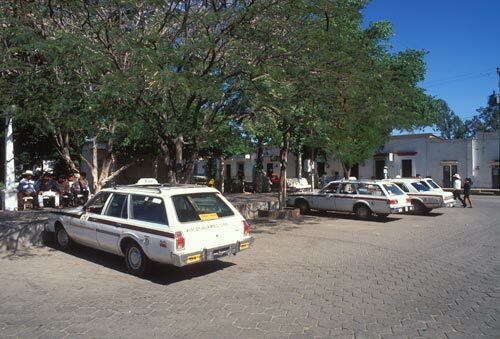 I learned the plan was we would take a taxi from the Alameda Saturday afternoon and return Sunday afternoon. And off he went, a happy man crossing the Plaza on his way to his home at the northern foot of Guadaloupe Hill. At the time, Antonio was renting a three room apartment with a large backyard on Calle Aquiles Serdan for 400 pesos a month, $60 or so. From here all of the town and surrounding countryside can be reached. Immediately I started to have reservations. Over the next couple of days I went back and forth in my mind, should I go or should I stay? I was not feeling good and the concept of being in close approximation with four people inside a cab, including a sniffling kid did not bode well. In defense of the sniffling child, everyone here in late spring had a sore throat, cough, sniffles, or all of the above. Late Friday night I decided I would go. Saturday afternoon was noisy and colorful in the Alameda, as is it is on most weekends. There was much to see and many to be seen by. The bus station was extra busy with relatives coming and going to join their families and friends for Easter. Street carts cooked fragrant food. The cab reserved by Antonio was waiting for us. We all hopped in the cab. The trunk lid and doors were closed, the engined started up and we headed east on our journey away from today and towards yesteryears. As we left the cobblestone streets of Centro Álamos and traveled on dirt roads that connected the surrounding barrios and campo I thought of the arroyo we would be crossing that carried raw Álamos sewage towards the Cuchujaqui River. I looked up and there in the Arroyo de la Aduana, east of Arroyo Agua Escondia, Arroyo la Barranca and Arroyo la Aduana’s confluence, was the beached remains of a future-to-be wastewater treatment plant that was under construction when Hurricane Fausto destroyed it the preceding summer. I understood that when completed it was designed to reduce raw sewage that had been free-flowing east for a couple of centuries. And so it was, the technological future had yet to arrived as we prepared to travel back in time to when and where Spaniards irrigated their 18th century orchards with foot-wide-brick-lined aqueducts. The arroyo, carved by seasonal rains, snaked through dry dusty hills. We passed the cemetery and Ida Franklin’s house and made a turn to the right on the narrowing road and we were immediately in the country. The town was behind us, the Sierra Madre foothills ahead. The rutted road traveled next to the arroyo that we would have to cross from time to time. When we did I would hold my breath to avoid sewer gas wafting up from the tainted runoff. Every once in awhile we would pass modest dwellings. The farther east we went the greater distance between humble ranches. After a fifteen to 20 minutes ride we arrived at our destination, gathered up all our bags and started a short walk through dried orchards up to the house. We were greeted by Antonio’s mother and two brothers. One brother was the family comedian who worked in town as a laborer and the other Moro who lived on the ranch. Moro spoke only to animals. Antonio’s father was there but I never saw him in person. One of Antonio’s sisters and her husband and daughter would arrive later from Navojoa. And here we were, here where Antonio was raised as the youngest of 17 children. 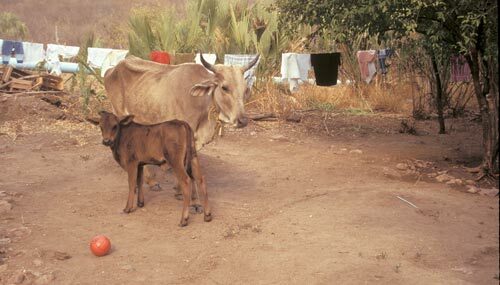 Cows are interested in a little one on one football as the clothes dry. We were here, unconnected from the 20th century. The Figueroa ranch was above and a good distance from the arroyo. Behind it was a large hill that we would climb the next morning. 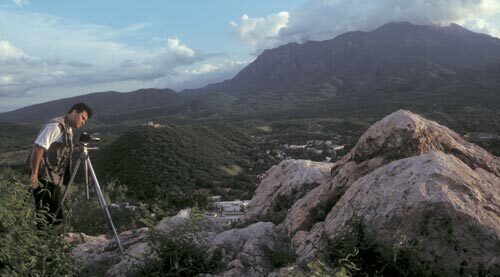 One of the points that Antonio made was we would have a good high ground view of Álamos from the east. 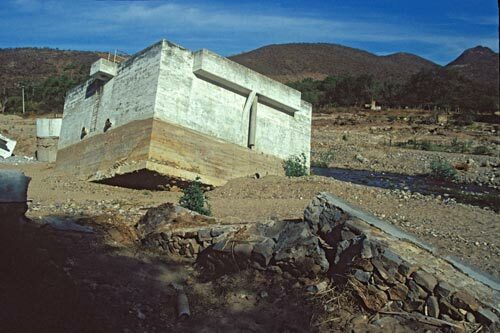 Though the house was not connected to any wires or modern sewer lines it was connected directly to the big blue water pipe that brought water a good distance from the Cuchujaqui River to the east near Sabinitos. An author’s aside: this is the same Cuchujaqui River that Álamos sewage was headed towards. 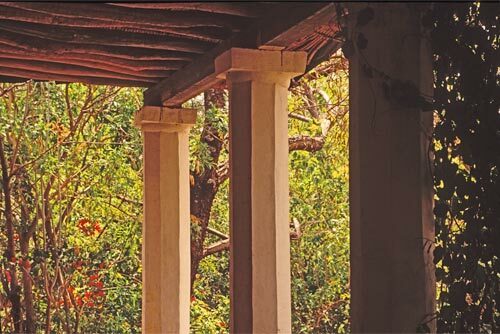 When the blue pipe reached the Figueroa ranch the builders wanted to keep it running in a straight line run through a barn and corrals behind the house. The workers put a faucet into the pipe in exchange for damaging Figueroa property. When we arrived I was cautioned to be careful when I turned water on because of the great pressure coming from the big blue pipe, unrestricted, to the sink or shower. On being connected, one can always be disconnected. Time for a hour or two of solar panel powered TV. Grandmom keeps cooking. The brothers and I went out to watch the sunset and arriving stars. They were playing a game they always played when together on the family ranch. Who would see the first passing satellite that evening? As we searched the heavens for the hand of man I noticed how quiet it can be away from the city. 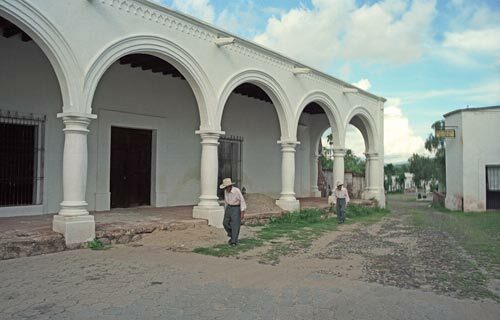 Centro Álamos is not a quiet place: church bells on the quarter hour, radios, televisions, cars, trucks, humans, dogs, cats, burros, city bred farm animals, native birds, insects… Here at the ranch, warm soft breezes rustled dry grass and branches as crickets fiddled. We concentrated on the sky. And the game was done, Moro spotted the first satellite. The comedian brother turned to me and said Moro always wins this simple but cosmic game. We retired to the house and awaiting dinner. Antonio’s mother was dishing up food off the big wood burning stove. The women and daughters were watching, more listening, to a TV. This was courtesy of a small solar panel provided by a government program intending to give all the rural off-line ranches access to solar generated electricity. Modern times allowed this household to chose between a radio for eight hours, a light for three or four hours or the small black & white television for an hour or two. Or some combination of electrical appliances at night for as long as there was stored energy. Choices, choices, choices. I knew I would have a good sleep and I looked forward to Easter morning with the Figueroas in the Campo. The morning began with a tour of the brothers’ bedroom. While going to school the brothers had lived on the ranch and the sisters lived in town. It was a long country walk to and from town for the boys. There had been seventeen sisters and brothers. Now it was the father, mother and Moro. Over the years, mother, who could not read, had acquired a large library of books and drafting tables for the boys. As I walked into their room, isolated from Alamos by distance and geography, the world was in their hands by picking a volume off the book shelfs. Antonio and his brothers were proud of their childhood bedroom. They knew this was a special place. I remember the moment as a hopeful dream with knowledge being the coin of the realm and all that is good in command. Two girls and their uncle, in the back rest reading, after breakfast. We all went into the kitchen to join mother cooking breakfast. There was no TV, radio or computers but there was paper and pen. And so the Figueroas entertained themselves by drawing caricatures of each other. There was an innocence in the room as they showed their cartoons and the others laughed. Joyous home entertainment without electricity. Outside, the only sounds were time passing by as these humans reenacted a common thread throughout all of mankind from the creation of paper to the power grid. So much had changed so quickly. The world Antonio knew is not the world his father knew. Many call this progress. Few ask of unintended consequences. I felt at home in a world I understood. 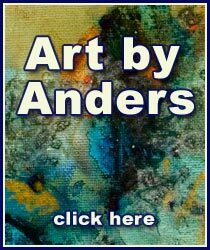 You can see Anders art at artfeats.com. Every day he walks the long walk from the family ranch and returns. Antonio’s father, as a young man, held a infant girl in his arms. This baby grew up into a young woman and the now aging man married her. Together, they would have seventeen children. Antonio was the last born born to an elderly man who now hardly, if at all, recognized his youngest child. I had seen the father in the late afternoon walking into town. I asked Antonio where he was going and he answered ” to church and then he turns around and walks back to the ranch.” Walking is the form of transportation that most people use in Alamos. Elderly people on their daily walks are a common site. In many cases one could tell time by their passing by. The father’s walk from the ranch is another leap, as far as walking goes, in magnitude order. I am sure there are well-worn foot paths through arroyos and over hills, as old as man, that cut the actual distance compared to the many miles our taxi negotiated in reaching the ranch from town. It is late Spring looking west at Alamos from the ranch's high ground. Antonio and I hiked after breakfast to the top of the hill the ranch sat on. The hills and valley were dry. The sky was dirty with dust and smoke from burning farm fields surrounding Navajoa to the west. This is the way it is in late spring. 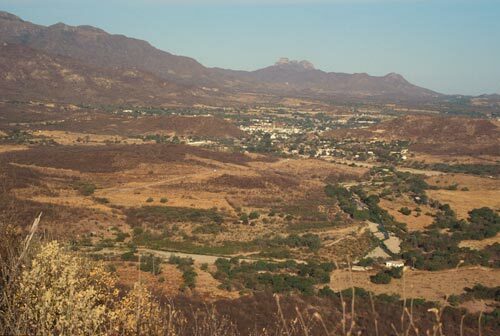 Álamos is two hills to the west and Cacharamba crowns the western horizon. 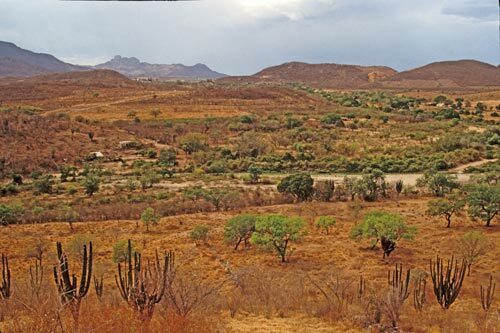 Beyond that the Sierra Madre foothills descend to the great agricultural flood plains and the Sea of Cortez. In the distance a young boy was playing stick with his dog. It could have been Antonio’s ghost from 15 years past. From here, a place to take in what living really means, the struggles and rewards travel on the wind. We, as one, are the past, present and future. Two brothers raised on the ranch, a photographer and an architect-artist. 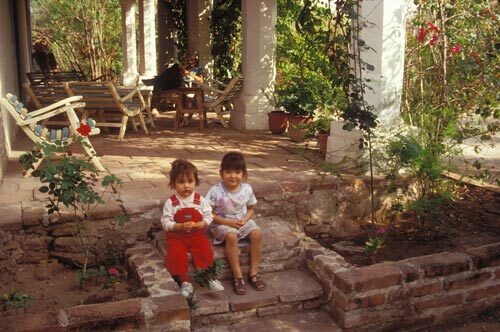 The seventeen Figueroa children went their own ways. A brother became a priest, a sister worked in the Vatican. Some became teachers. Some did not marry and those that did planned to have two children, no more. It is an amazing step forward in one generation, 17 children to two. Much of this deals with economies. Modern children are an expensive investment and for some marriage is an economic challenge. 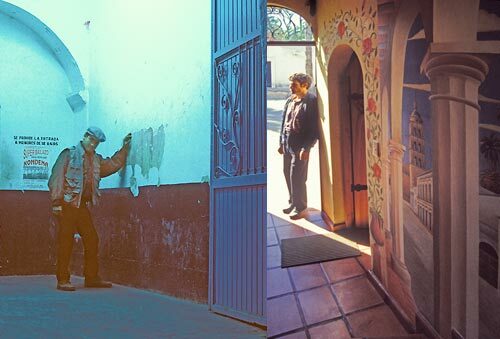 Above, Antonio poses as a drunk outside an Alamos bar and his brother, an artist-architect working in Guadalajara, stands next to one of his murals he painted while in Alamos. Both of these brothers are skilled and accomplished. I think back to their bedroom on the ranch. This is where they came from, a room of books and drafting tables. Antonio Figueroa doing what he loves, taking pictures with nature's warm light. A photographer and his town. A man in the moment. A father seeing the future. A husband embracing the present. A son understanding the past. This photo of Antonio, at work, is a portrait of all these moments and much more. Summer comes once a year, ten times a decade and a hundred times in a century. Each summer washes away the previous seasons and starts many growing cycles anew. 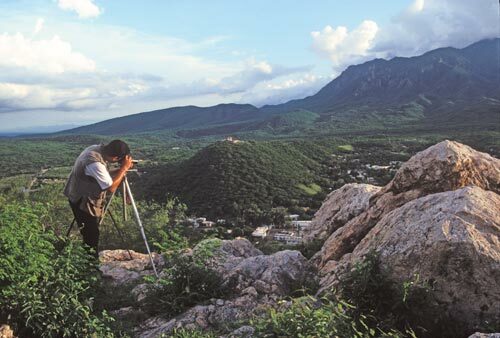 Nature’s cycles are meaningful, as is Antonio taking sunset pictures of summer Alamos from high ground. Antonio Figueroa sets up for a sunset shot ending a brilliant summer day. 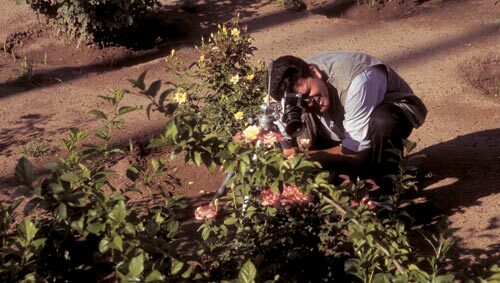 Antonio, I am glad to hear, remains a professional photographer in Álamos, Sonora, Mexico. He was of great assistance during my 1996 summer shoot. His enthusiasm for what he was doing, and eagerness to try new things, made him a great working companion. Antonio Figueroa knows he lives in a special place filled with family, friends, man-made and natural beauty. From the macro to the micro it all has potential in Antonio's eye. 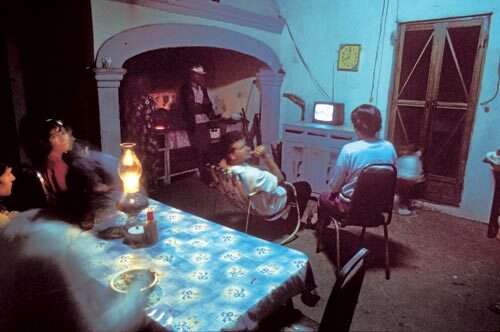 If American photographers think life is hard try stepping into a Mexican photographer’s shoes. The market is limited by the their customers incomes. And most of these people can only afford photos of turning points in their family life. For artists like Antonio, it is a balancing act to pursue his love of landscape, light, form – magical moments camera lens create and capture – with little market demand for these efforts. These were the days of film cameras which costed much more in Mexico than the USA. Antonio did not have access to the film stocks I was shooting. In some cases he would need to ride a bus for half a day to find film for a shoot, and there was no guarantee it was on the shelves. I hope the digital age is making life easier for professional Mexican photographers. It was a proud moment for Antonio to display his work at a photo exhibition. 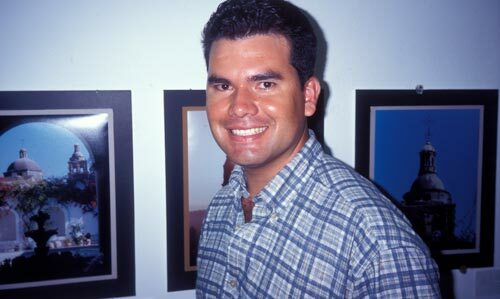 Antonio was part of fotoseptiembre which ran for the month at the Museo Constumbrista de Sonora in Plaza de las Armas. He is seen here with his work. It took a great effort to frame his pieces as he did. No shortcuts. I have selected twelve events or people as subjects for short Álamos essays. Antonio is one of these amazing stories. More to come.